Looking for a nice, short hiking trail in Gatlinburg and the Great Smoky Mountains National Park? 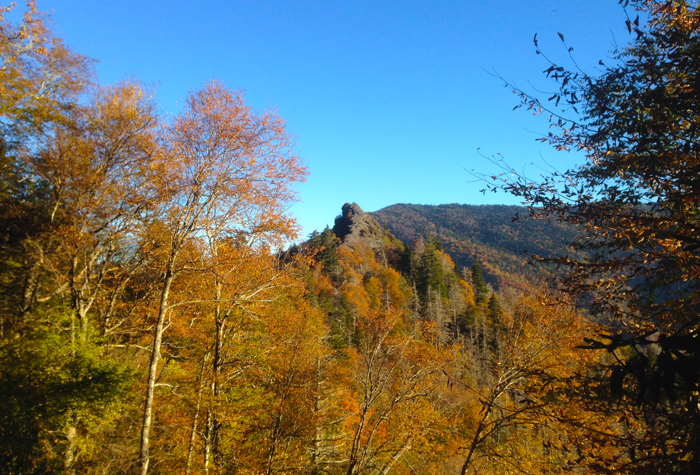 Check out this guide with the best short hikes around Gatlinburg, Tennessee! These short hikes are all easy for beginner hikers, less than 5 miles in length, and they each have a beautiful destination with a waterfall, a mountain view, or a historic site you'll love to see. Check out our list of the 10 best short hikes in Gatlinburg and the Great Smoky Mountains National Park! One of the best short hikes near Gatlinburg is also one of the highest elevation trails in the Smokies: The trail to the Observation Tower on the top of Clingmans Dome. 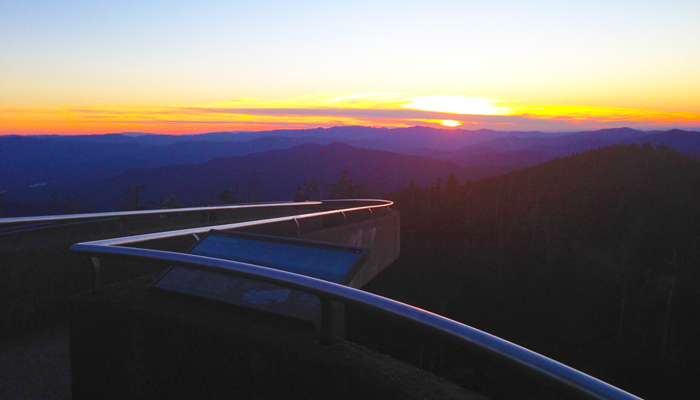 This brief, but impressive trail takes visitors from the Clingmans Dome Parking area to the iconic observation tower at the summit of Clingmans Dome. At an elevation of 6,643 Ft. Clingman's Dome is the tallest mountain in the national park and the tallest peak in Tennessee. After making the 0.5-mile one-way hike, you'll be treated to panoramic views that go on for miles. On a clear day at the observation tower, you can see 100 miles in all directions. Though this trail is paved, this short hike is not necessarily easy since the trail is quite steep. Luckily, several benches located on the trailside provide ideal rest stops on your way to the summit. Visitors should note that the Clingmans Dome Road is closed to vehicles from December to March due to poor weather, so it's difficult to reach Clingmans Dome in the wintertime. The Andrews Bald trail is arguably one of the best short hikes near Gatlinburg with excellent mountain views. 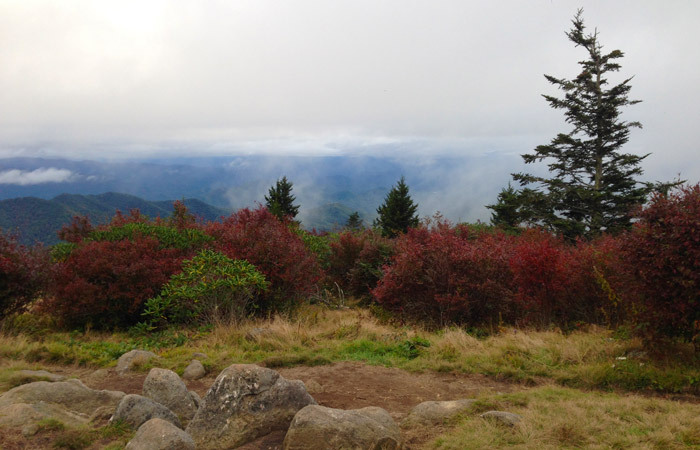 Visitors can reach Andrews Bald by hiking 1.75 miles down the Forney Ridge Trail which is accessed near the Clingmans Dome Parking lot. As you descend from the trailhead, you'll pass through lovely sections of high elevation spruce-fir forests that thrive in the wet, cool peaks of the Smokies. After a short hike, you'll reach Andrews Bald, a high elevation field that features stunning views of the North Carolina side of the national park. In the Appalachian mountains, a bald is a "bald spot" on a mountain that is surrounded by forests. These areas are known for having gorgeous mountain views and unique plant life. The hike to Spruce Flats Falls is one of the lesser used trails in the national park and it does not appear on most park maps. Though this hike is not heavily advertised, it is probably one of the best short hikes in the Smokies for enjoying a beautiful sight for little effort. This short, easy hike begins behind the Tremont Institute in the Tremont region of the national park. To find the trailhead, park at the institute and proceed up the hill towards some buildings. You'll see a trailhead to the left that splits off to Lumber Ridge Trail. Follow the right branch of the trail to continue towards Spruce Flats Falls. After a moderate hike along a mountainside and a short descent to the stream, you'll see Spruce Flats Falls, a multi-tiered waterfall with a small pool at its base and several cascades. The largest tier of the falls is 30 ft. high and is highly photogenic. 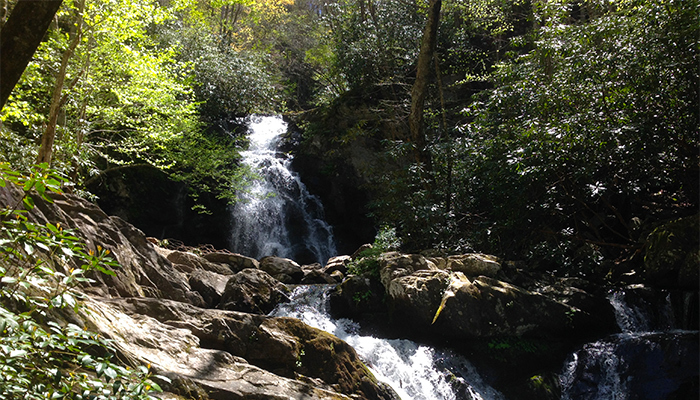 This short waterfall hike near Gatlinburg is one of the most popular hikes in the Smokies! 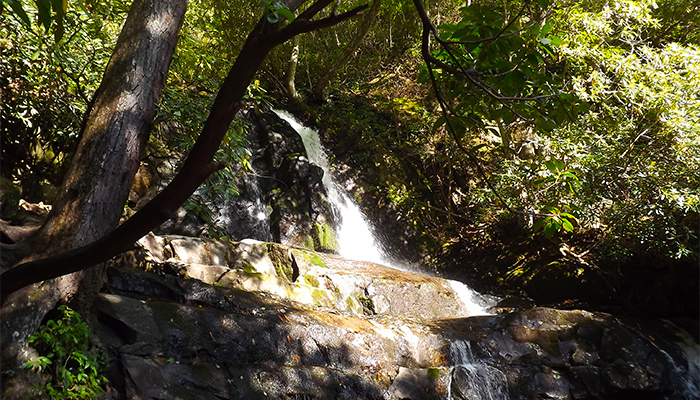 With a rewarding, moderately difficult hike and a nice 80 ft. multi-tiered waterfall, the Laurel Falls Trail lives up to the hype as a true classic hike in the national park. However, visitors should note that this hiking trail is often crowded. If you'd like to enjoy Laurel Falls without the crowds, we recommend starting your hike early in the day or visiting in the off-season. 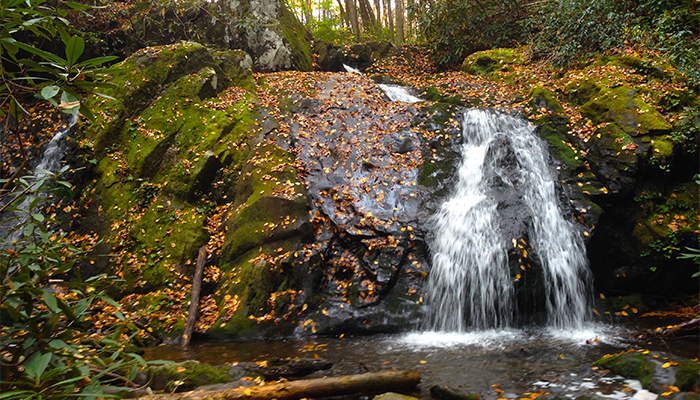 Named for the mountain laurel that blooms along the trailside, this paved trail meanders along a mountainside before passing through the upper and lower sections of Laurel Falls. The Chimney Tops is a beloved, classic hike in the Smokies that's well-worth seeing during your visit! Following the 2016 wildfires in Gatlinburg, the famous Chimney Top pinnacle was closed due to damage of the fires, but this rewarding hike still features impressive views of nearby Mt. 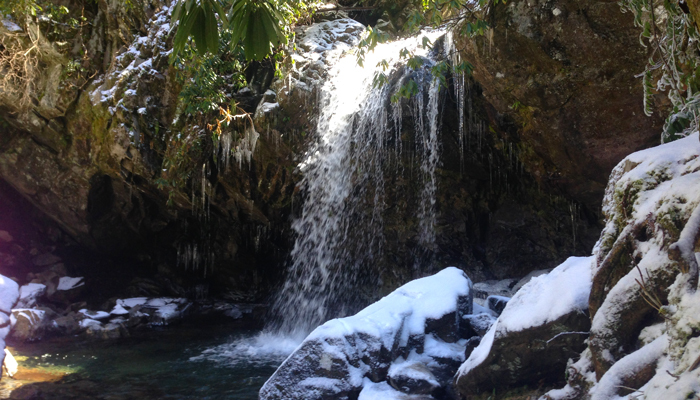 LeConte, so it's well worth a visit. Though this hiking trail is relatively short, the trail is quite steep and is moderate in difficulty. Along your way towards The Chimney Tops, you'll pass through beautiful sections of mountain streams and hemlock forests. Located in the less visited Greenbrier region of the Great Smoky Mountains National Park, the Porters Creek Trail is a verdant hike that's well worth experiencing during your trip. Better yet, this short easy hike is ideal for beginners and it also features several highlights along the way! This hiking trail is also one of the best places to view wildflowers in the national park during the months of March and April. On the trail, you'll be treated to several historic sights like the John Messer cantilever barn that was built in the 1870s and the old Smoky Mountain hiking club cabin that dates from the 1930s. Near the end of the trail, you'll reach the 60 ft. Fern Branch Falls which is a nice place to cool off during the warm summer months. Though this hike is just over 5 miles in its round trip length, The Abrams Falls trail is such a classic hike that it easily makes our list of the best short hiking trails in the Smoky Mountains. This beautiful trail that begins at the far end of the Cades Cove Loop road descends to Abrams Creek over several miles. At the end of the trail, you'll reach Abrams Falls, an impressive 20 ft. high waterfall that plunges into a deep pool. Though this mountain pool might look ideal for swimming, this is highly discouraged. As the highest volume waterfall in the Smokies, Abrams Falls produces powerful, dangerous currents that have been known to drown swimmers. Mist produced by the falls also makes nearby rocks slippery and hazardous. As a result, this waterfall is best appreciated from the marked trail. Grotto Falls, one of the most distinctive waterfalls near Gatlinburg can be reached by hiking a few miles up the Trillium Gap Trail just off of the Roaring Fork Motor Trail. As you make your way to the falls, you'll pass through lovely sections of Old-Growth hemlock forest that were never logged. 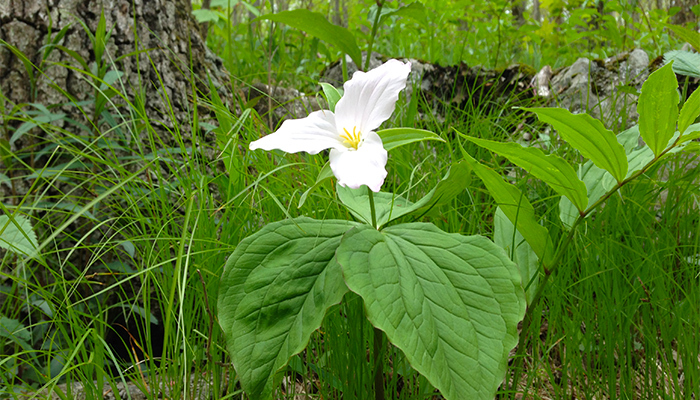 This region of the park is also known for having lovely wildflowers in the springtime. After 1.3 miles, you'll reach Grotto Falls, a 25 ft. waterfall. The trail itself passes through a "grotto" behind the waterfall that has formed from years of freezing, thawing, and erosion. As a result, Grotto Falls is a waterfall that you can actually hike behind. 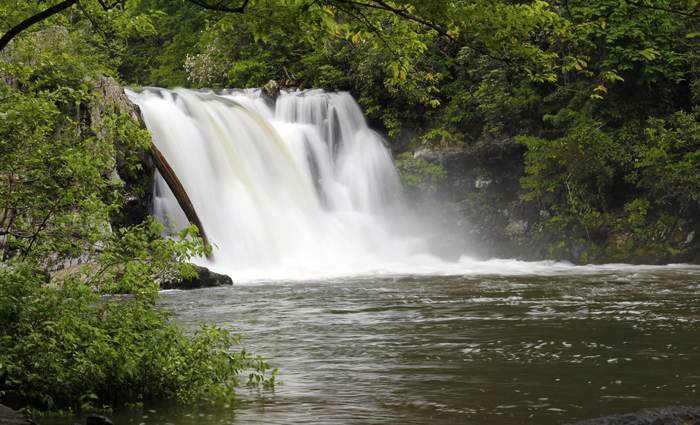 While the famous Sinks Waterfall is a destination unto itself, you can continue on this pleasant hiking trail to see another nearby waterfall: Upper Meigs Creek Falls. This short hike passes through several ecosystems as you make your way to the creek. At 1.2 miles in, you'll reach the falls and a nice place to cool off in the warm summer months. Please note that this hiking trail requires several stream crossings, so this hike is not recommended during rainy weather. This short hike begins just across the river from the Metcalf Bottoms Picnic area. To reach the historic Walker Sisters cabin, take the Little Brier Gap Trail. On your way, you'll pass by remnants of the little Greenbrier community: a graveyard and an old church/schoolhouse. By hiking further, you'll reach a side trail that leads to the Walker Sisters place. The oldest structures on the property date from the 1870s and they were inhabited by the Walker Sisters until the 1960s. Though the national park was created in 1934, the Walker Sisters were permitted to continue living on the property under a lifetime lease. 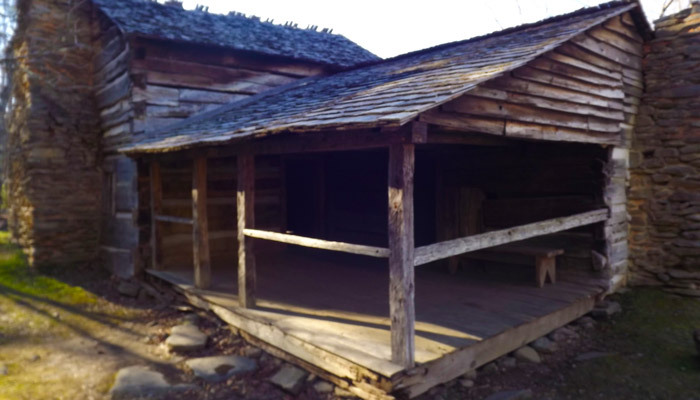 Today, you can explore the interior of their cabin, a springhouse, and a corn crib. Though there are lots of beautiful hiking trails in the Smoky Mountains, some are longer day hikes that take many hours to complete. For a nice sample of the natural wonders of the Smoky Mountains, these short hikes are perfect for seeing the highlights of the Smokies without having to spend all day hiking. If you want to really challenge yourself, check out our list of the most difficult hikes in the Smoky Mountains. We'd love to know, what's your favorite short hike in the Smoky Mountains! Feel free to share your thoughts in the comments section below!